Oh Carin this is stunning. It took me a moment to realize what i was looking at, just entranced by the patterning (pattern-lover that I am) and then I realized: not just a flock, a gathering much more grand than “flock” could connote: a congregation, or a convention…no, surely a principality of ducks!! Marvellous. Now I’m going back to study the pattern aspect again. What we have is a gaggle but surely something conjuring a better image could be found… a *nonchalance* of geese? Do they come as far west as you? Honk (nonchalantly) if yes. Another stunner Carin! I too am struck by the beautiful patterns and the repetition of shapes and colours. The over-exposure works so well, as does the shimmering focus. I love that you like the over-exposure… the way it blends into the screen white pleases me. OMG … Before I focused, this looked like brown, fallen leaves. 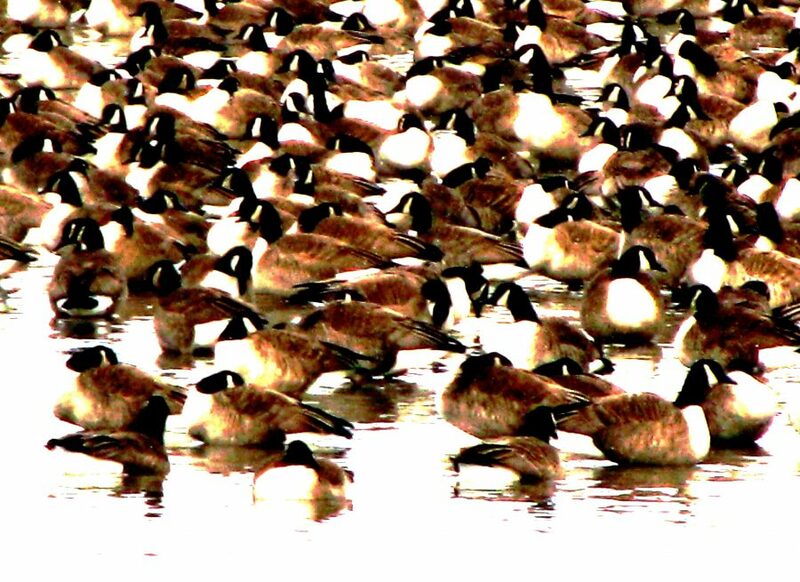 Not so, but a great WW capture of an endless number of Canada geese! Clever eye. I couldn’t figure out how a photo that is slightly blurry could work so brilliantly but then I realized that Allison above explains that equally brilliantly. Wonderful photo!